With illustrator, you can cut (ctrl+x) a node straight off the end of a path or out of the middle of it, and then paste it as a separate line. This is important for creating overlaps. For example I'm drawing a character, and I'm working on their hair. where I have one strand of hair overlapping another, I'll continue the path through to the end of the line, but I need the hair all to be one solid shape, so I'll select just that final node, cut it off, paste it as a separate line (it would copy the next nodes along too), and then I can change the line shape to make it taper, and continue back from the old line to continue along the shape. I'll try to post an example in the attached file. This is how I would work with Illustrator. But how come I can't do it in affinity? When I press ctrl+x, it just cuts the entire shape. Attached below is an example. To do this, I had to create the break point as usual (the part where it diverts to the next strand of hair) but then had to cop the entire line, and on one I deleted the overlap, and on the other I deleted everything except for the overlap. this is obviously really difficult to do, messy and time consuming. Am I missing something? How do I do this more simply? Or is it not possible. This is me trying to give affinity designer a second chance after getting very frustrated before and if I can't even get 3 lines in without already getting stuck I'll have to go back to Illustrator. 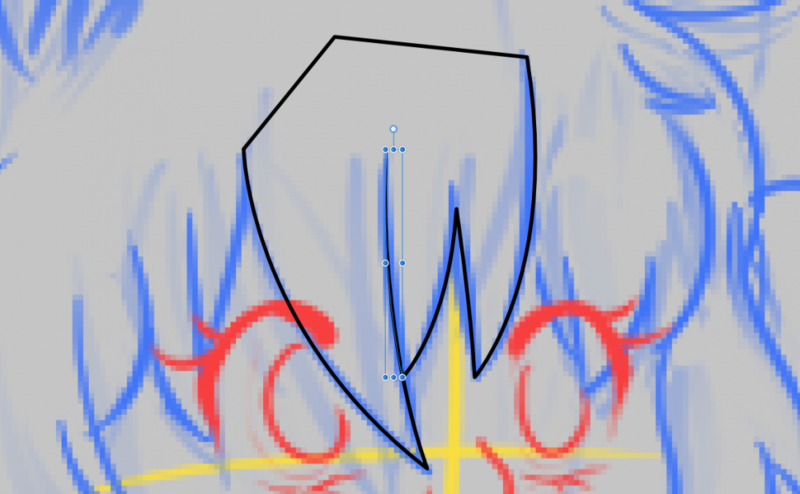 Update: I've managed to somewhat do what I want by selecting the "middle node where I want it to cut off and clicking "break curve" but this is very fiddly and time consuming. Howcome I cannot cut and paste individual specific nodes? Currently still working on this fringe hours later and I could have been much further along by now. Currently in Affinity Designer, breaking the curve is the best way of achieving this. The functionality you're describing has been requested before on our forums and is certainly something we'd like to add in a future version, along with a knife tool to perform very similar functions. To speed up your process slightly, you can assign a keyboard shortcut to Break Curve. Open Preferences>Keyboard Shortcuts, then in the second dropdown list in the top left of the dialog, select Node Tool. Here you can assign the aforementioned shortcut. Thanks! I hope it does. Both of those sound very helpful. Thanks for the tip. I'll just have to keep doing it this way for now. even if it is a little more time consuming.